I'm a spicy girl! I love spicy food! 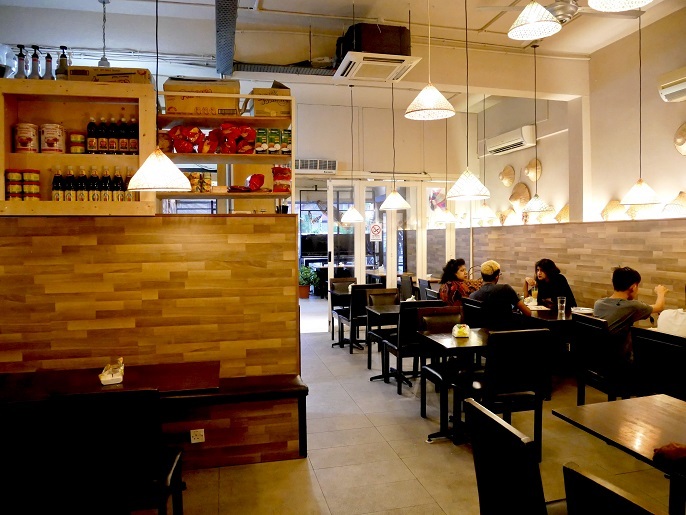 Sam Ro Thai Cuisine, which just recently established at Damansara Jaya! I visited the restaurant with my blogger friends on the other day. We came with 7 people, and ordered 10 dishes. At first, we thought we won't be able to finish all dishes, but all the food are too delicious, and at the end we finished everything on the table! 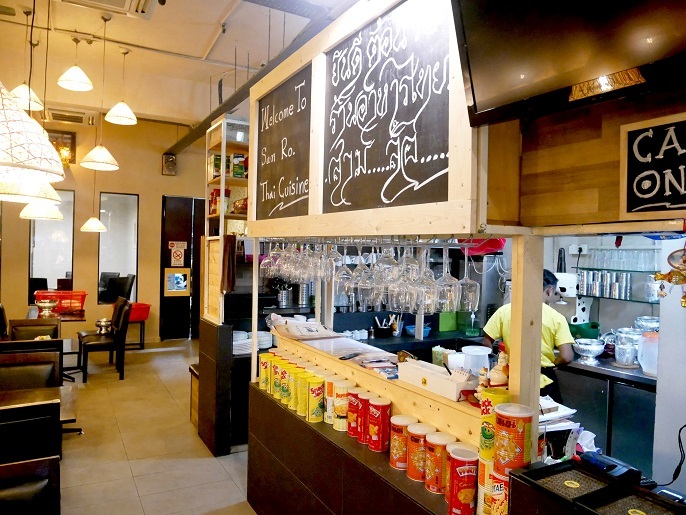 So, here I want to introduce the best dishes to eat when you visit Sam Ro Thai Cuisine. 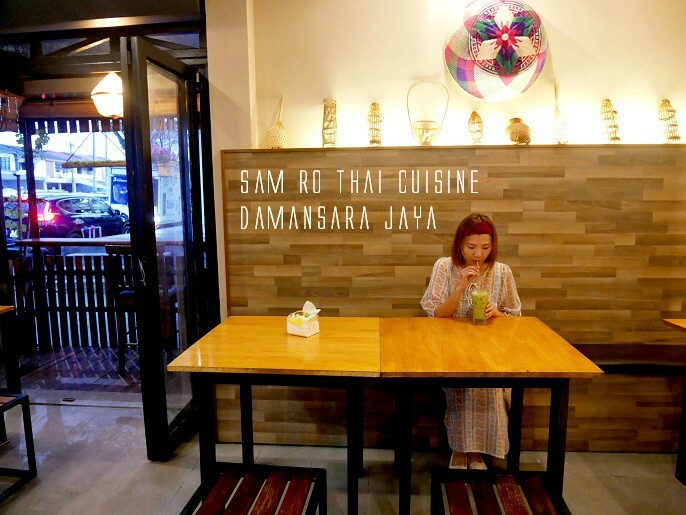 Sam Ro Thai Cuisine is a newly opened Thai restaurant at Damansara Jaya, whereby they just started the operation in a month ago. 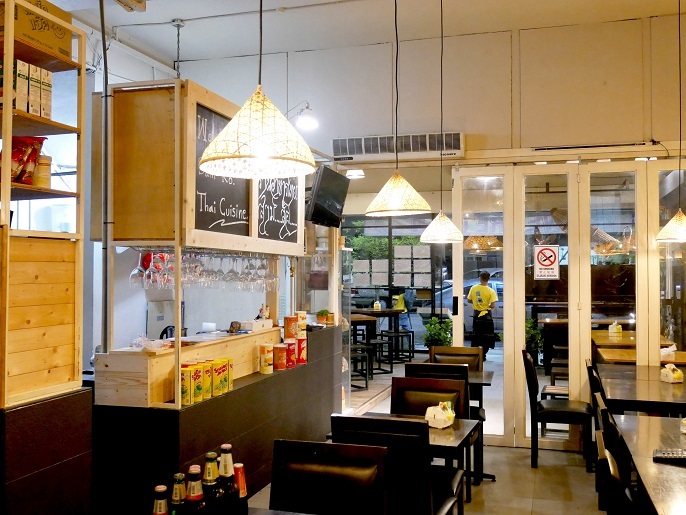 Sam Ro Thai Cuisine serves authentic Thai food at an affordable price by the chef from Siam. 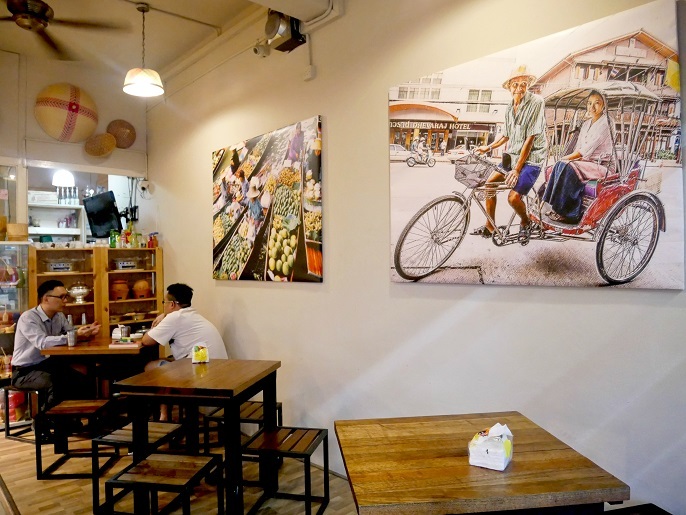 He understand the intricacies of local's appetite, and tailored his recipes to suit to the local palates. The seafood such as prawns and fishes are truly super fresh as they own their farm at Slim River. 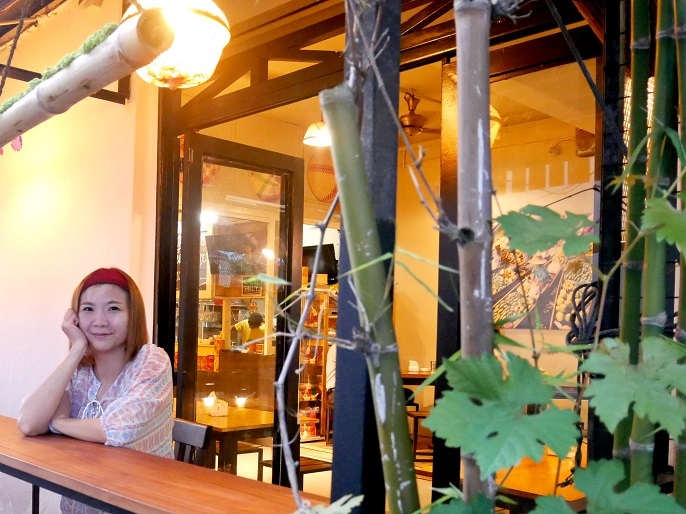 The restaurant is separated into three different sections, include outside dining area, air-conditioned main dining area and a private dining area for special gathering purpose. 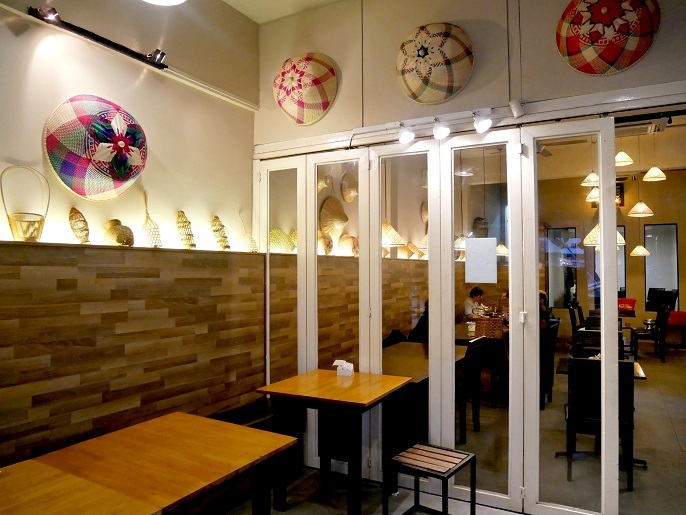 The interior decor is simple with no special frills, just the Thai-inspired wooden furniture, Thai ornaments and paintings on the walls. Also, the lighting in the restaurant has achieved a balance that makes customers feel inviting and comfortable. 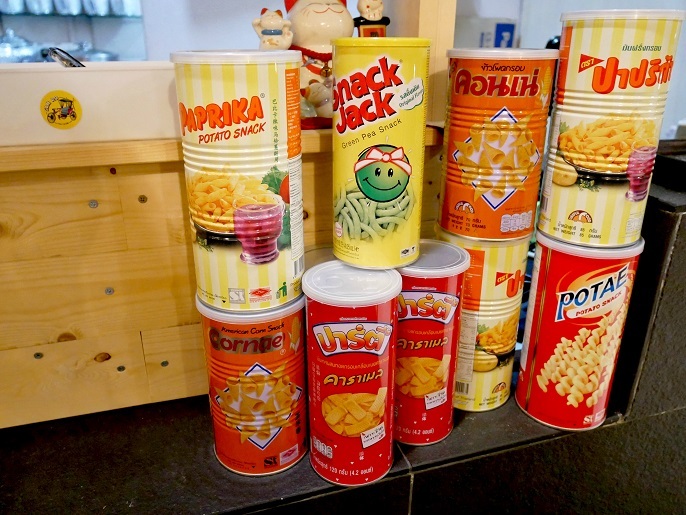 You can find a variety of Thai imported snacks at the checkout counter. And here's a list of the Thai foods we had at Sam Ro Thai Cuisine! 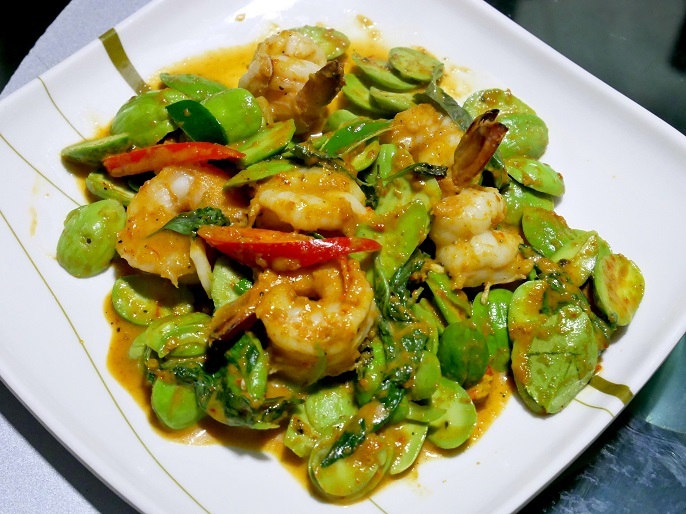 Simply delicious and healthy Thai Style Fried Kailan @ RM13 (S) RM25 (M) that you should order. 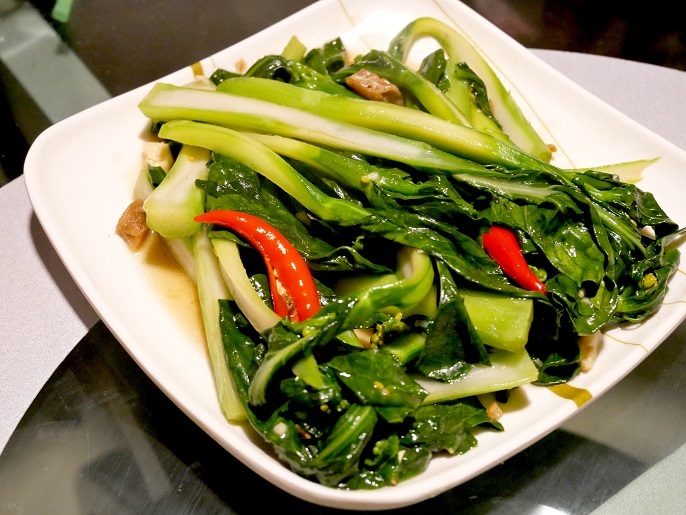 It's a delightful dish with the crunchy fresh Kailan that well blends with their own soy sauce. 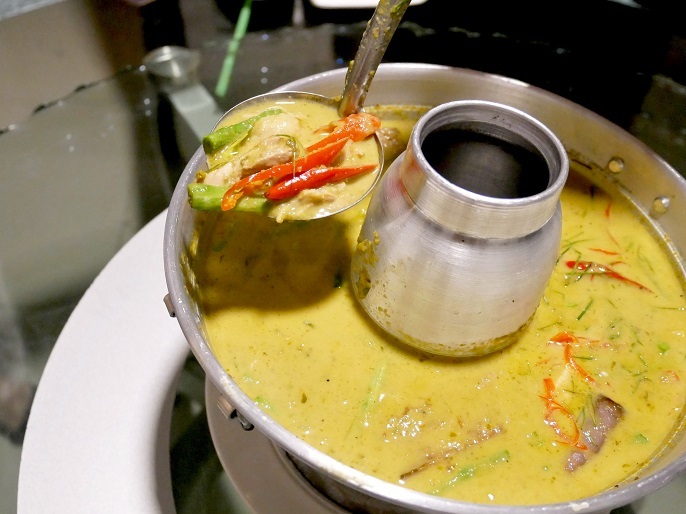 If you like curry, you will absolutely love this Green Curry Chicken @ RM18 (S) RM35 (M). The curry is not very spicy, indeed it has a rich taste of sweetness from the coconut milk, also it has milder flavour compare to red curry. Pat Red with Petai @ RM20 (S) RM38 (M) is a dish I just can't seem to get enough of. The in-house rich spicy sauce really made me eat more rice than anything else. 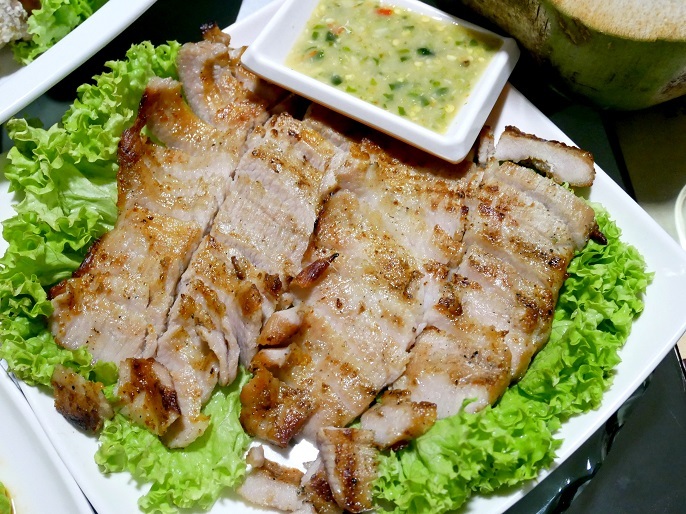 Authentic Thai Grilled Fish Recipe is one of the famous street foods in Thailand, and also my all-time favourite food to eat on the streets of Thailand. The fish skin is coated with a thick layer of salt, so it's best to remove the salty skin before you enjoy the moist and beautiful fillet. 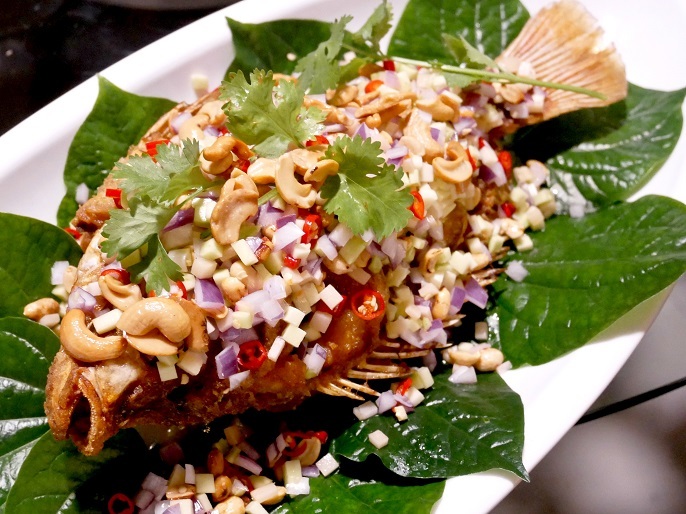 If you love fish, you should no longer wait before trying this Thai grilled fish recipe. Ohh, I'm sure you gonna love the special made seafood sauce too! 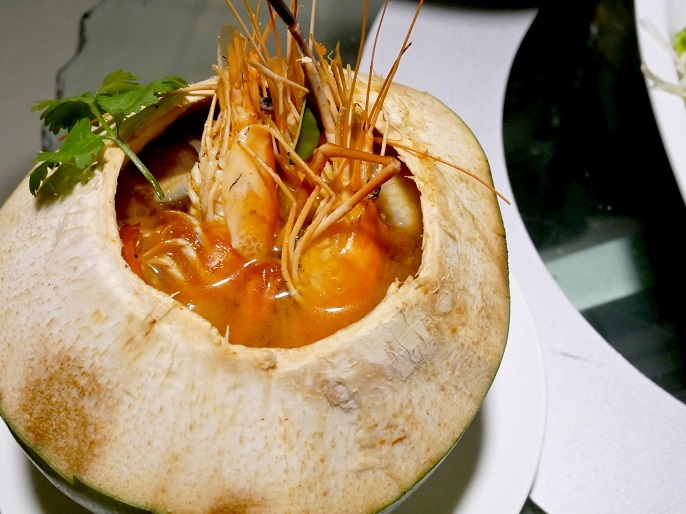 Tom Yam Seafood Coconut Soup @ RM25 is incredible delicious! 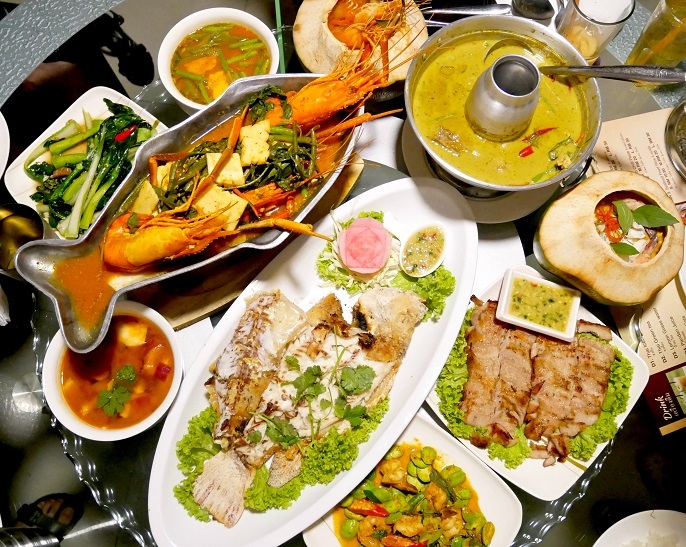 The hot and sour is loaded with different seafood such as big fresh prawns, squids, clams etc. Some other Tom Yam soups I had before were quite salty, but I'm happy with this one as the taste of the soup has a well balance taste of the salty, spicy and sour. 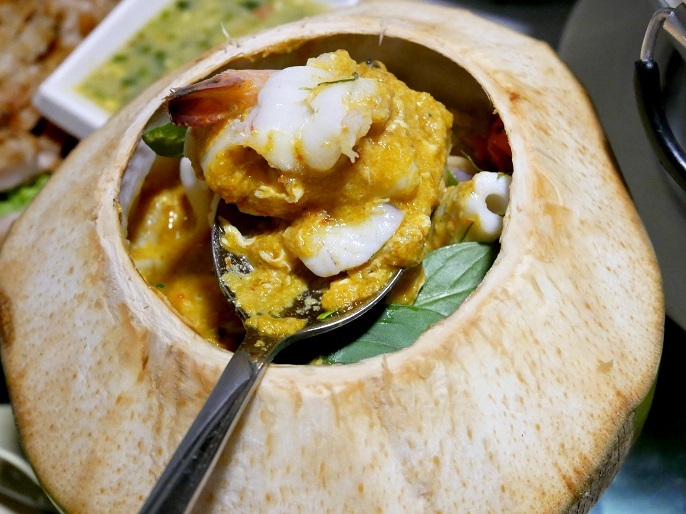 I love how the Thai Style Coconut Seafood Otak-Otak @ RM22 steamed inside the coconut with their special made creamy sauce of the chili paste and coconut milk. Oh! I'm so surprise to find the BBQ Pork Neck @ RM22 at the restaurant. It is a popular food in Thailand, but not many Thai restaurants that I knew serve it. The pork neck meat is so good, super tender and juice, also their own seasoning sauce is crazily best to dip in the pork too! Big Head Prawns Geng Som is a great bomb! 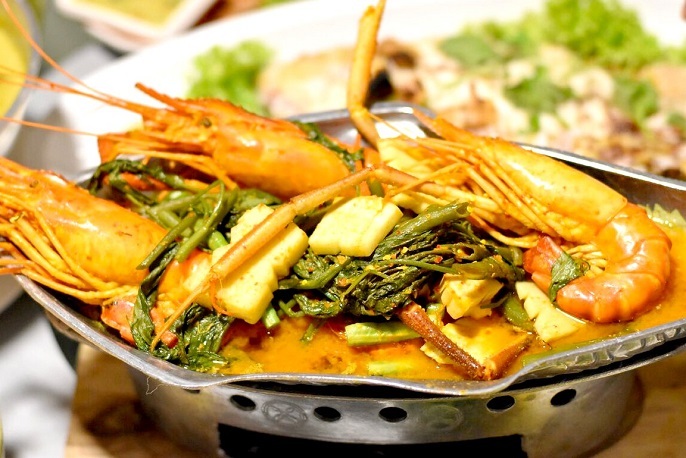 The big prawns are very fresh and very large in size, also it's so thoughtful to serve the flavourful sauce in an elevated pan with fire on the bottom to keep it hot. This dish surely get all your money worth! 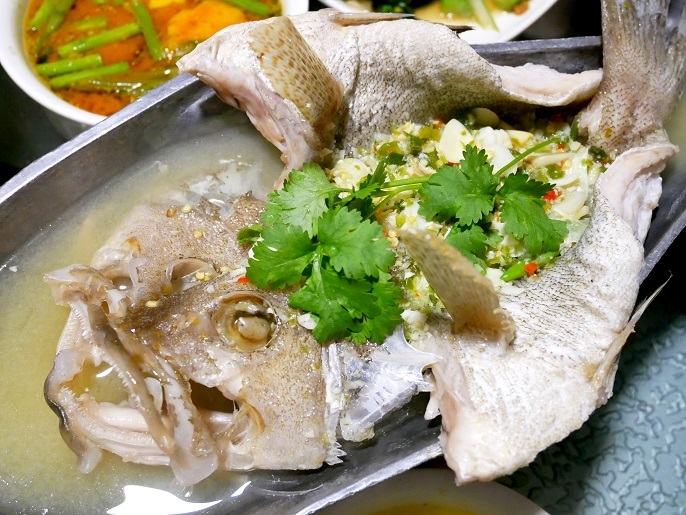 Thai Style Lemon Steamed Grouper, is a typical Thai dish to order when I visit any Thai restaurants. 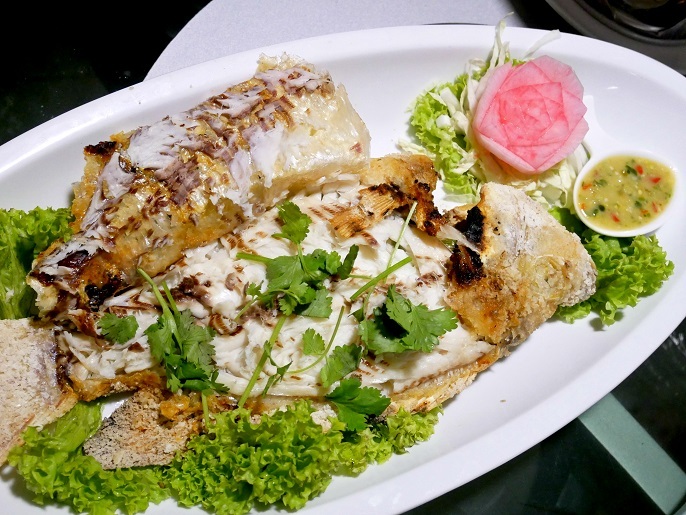 The flavourful ingredients like fresh herbs, lemon grass, garlic sauce, and tangy lime, make the taste just so well. The sour and spicy taste is so desired to enjoy with steamed rice! Pla Ban Suan Fried Tilapia is something special for me as I never had it at any other Thai restaurants before. A crunchy fluffy fried Tilapia served with mango salad, ginger, garlic, cashew nuts, and peanuts. You can either eat the fish just by itself or eat with the piper sarmentosum leaf that served at the bottom of the fish. All food were awesome, but the Mango Stick Rice @ RM10 is slightly disappointed. 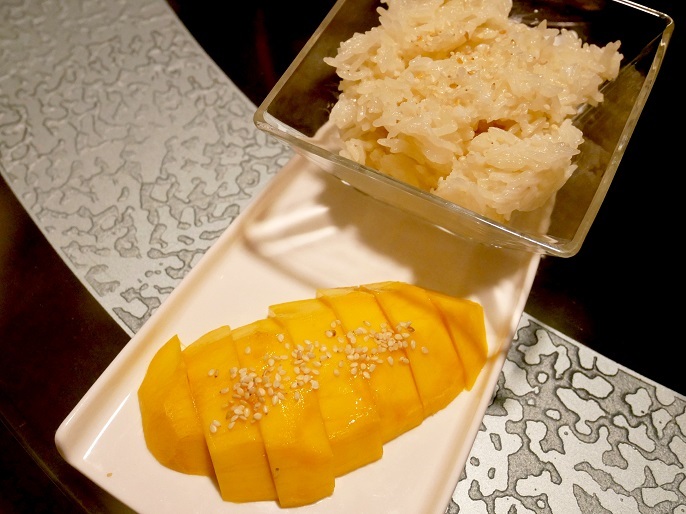 I find the sticky rice was lacked of flavour, and the mango was a bit too soft. 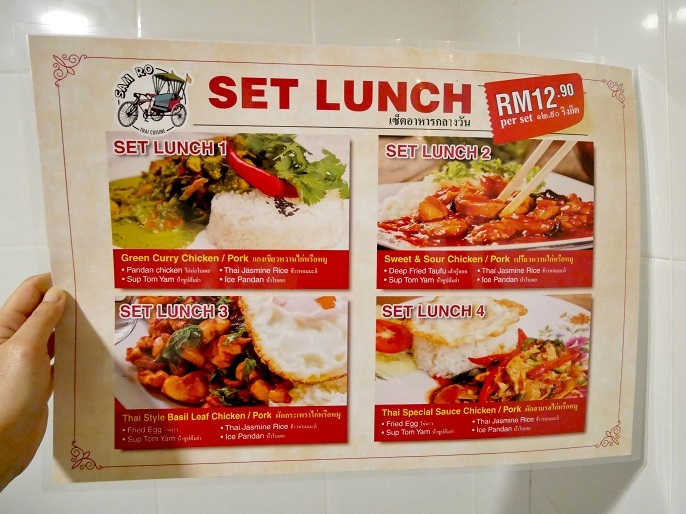 Lunch sets are also available at Sam Ro Thai Cuisine, with affordable pricing. 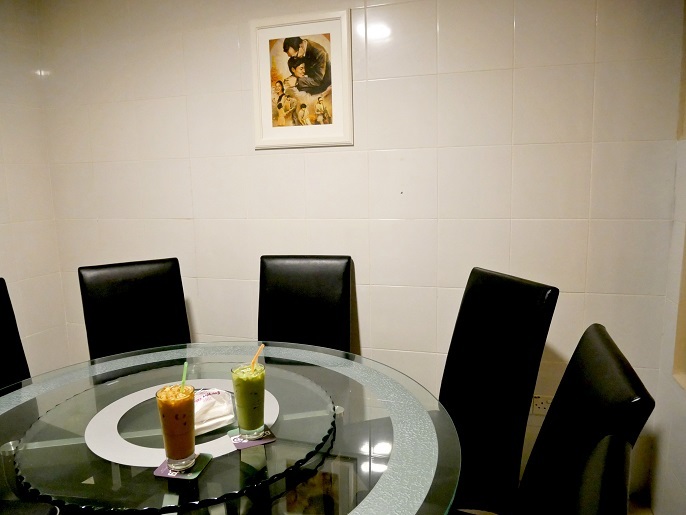 There are 4 choice of lunch sets, and each sets come with a Tom Yam Soup, and a glass of ice pandan water. Definitely worth checking out yea! 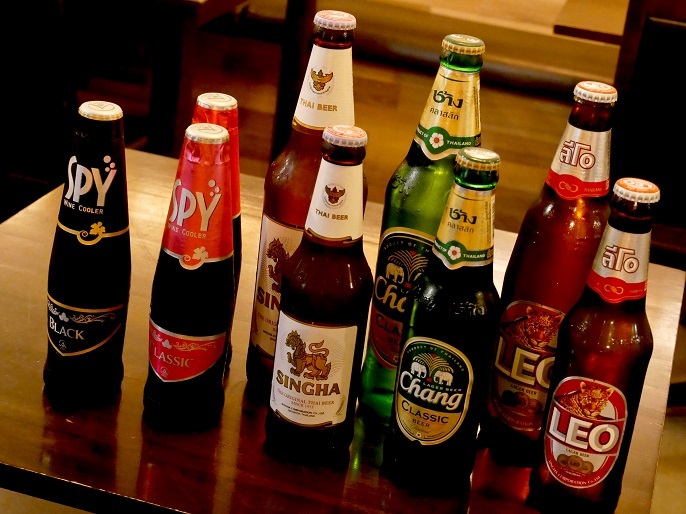 Besides, they also have a wide range of Thai beers such as Singha, Chang, Leo, Spy wine Cooler. All beers are tax free; so beer lovers, let's pick one and drink! 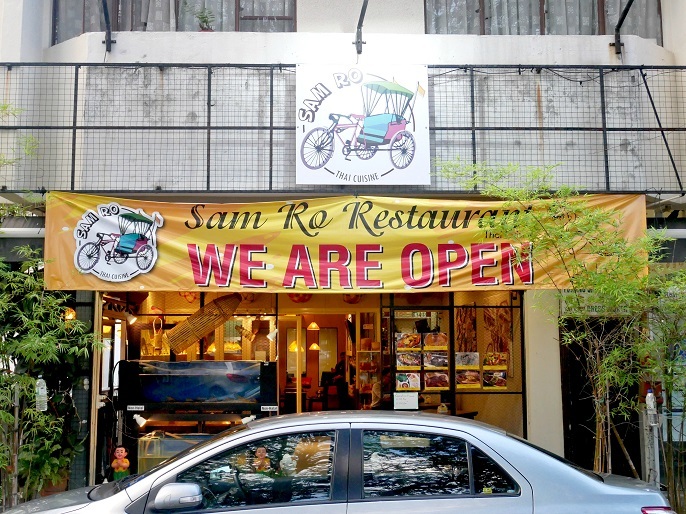 Sam Ro Thai Cuisine will surely give you savouring Thailand's rich cuisine in every bite! The food here is great, the service is wonderful, and the restaurant appearance is clean and welcoming as well. It's gonna be my top favourite place to go for Thai food, I absolutely love their food, and can't wait to try their other dishes. Highly recommend it to Thai food lovers or for anyone passing by.